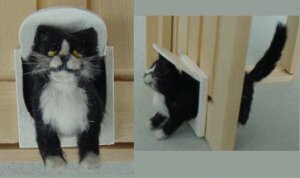 This is a very cute Tuxedo Cat coming through a cat door. There are 2 pieces, the head and the backside! You attach 1 piece on each side of the door and you have a instant cat door ! The cat is handmade by Anne Willis of Fine Design, who is a great artisian.